Begin with an organic rich mobile phase, and decrease organic content in increments of 10% to achieve elution of compounds with k ranging from 1 to 20. Change from one organic modifier to another (i.e. ACN, Methanol, THF) to enhance chromatographic selectivity and improve peak shape and efficiency. For ionic compounds change the buffer pH and composition to enhance selectivity and improve peak shape. Increase the ionic strength of the buffer system to improve peak shape of highly ionizable analytes. Increase the operating temperature to decrease analysis time and improve peak shape and efficiency. Use Acetonitrile or THF / Water mobile phases with at least 5% THF present. The composition of the organic modifier may be adjusted to provide maximum efficiency, selectivity, and the best peak shape. 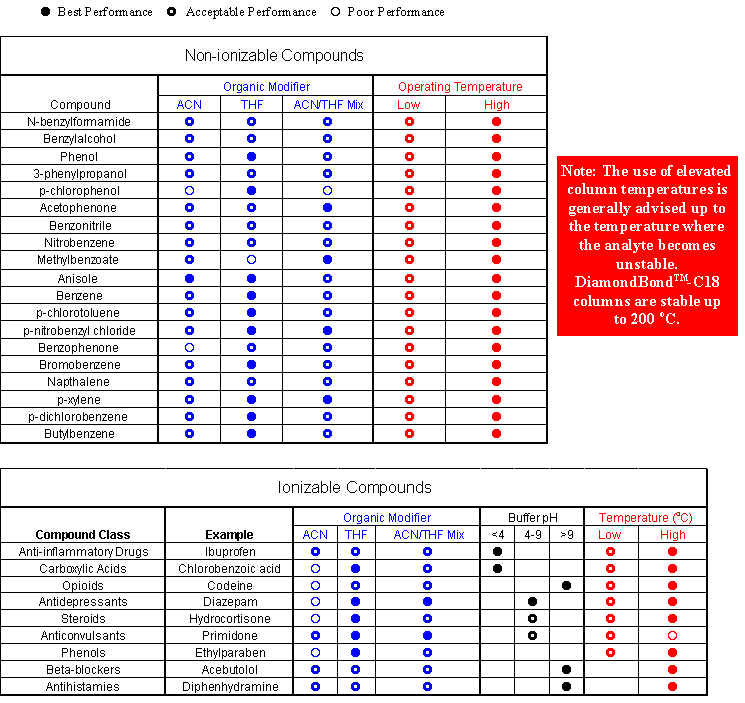 Use elevated operating temperatures when possible and as allowed by the stability of the analyte. Use higher percentages of THF in the mobile phase for highly polar and polyaromatic compounds. Use at least 20mM phosphate buffer systems for the aqueous component of the mobile phase, using phosphoric acid as the phosphate source at very low pH. The addition of a fluoride salt may be useful when operating above pH 4. The use of ammonium salts of fluoride and phosphate is preferred over the sodium and potassium salts. A minimum of 5% THF organic modifier is recommended for improved peak shape. DiamondBondTM-C18 columns are stable even at pH 1. Use at least 20mM phosphate buffer systems for the aqueous component of the mobile phase. The use of the ammonium salt of phosphate is preferred over the sodium and potassium salts. DiamondBondTM-C18 columns are stable even at pH 14. For very basic compounds with pKas greater than 10, operate the column at the maximum temperature allowed by the HPLC system. When doing this, one may need to lower the organic content to maintain enough retention. For zwitterionic compounds, increase the ionic strength of the buffer system and adjust the pH until a suitable separation is achieved, while operating at a high column temperature. For information on ZirChrom� products feel free to contact us online.